Ultra NT rFoil is an aluminum foil based radiant barrier made up of two reflective surfaces, sandwiched around a high-strength reinforcing woven scrim. 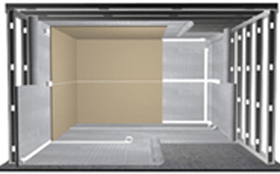 Signals Defense is proud to be an authorized dealer for Ultra NT Radiant Barrier ® and prides itself in being able to assist in the various installation techniques for maximum effectiveness. In addition to its superb RF shielding effectiveness (100MHz – GHz: 85 dB), Ultra NT Radiant Barrier® reflects up to 97% of radiant heat, increases sound attenuation in secure work environments, offers thermal performances unaffected by moisture, and increases existing insulation performance. For more information about ordering Ultra NT Radiant Barrier®, please contact us. NT rFoil is a heavy duty radiant barrier sheet made up of a single layer of woven polyethylene material bonded to and sandwiched between two highly reflective aluminum foil surfaces. rFoil is designed for use in commercial applications as a highly effective radiant barrier. Solid or perforated versions are available. The solid version is an approved vapor/radon barrier. This is made of UV resistant bi-axially oriented polypropylene, with a cold weather solvent acrylic adhesive. This tape helps maintain a complete seal in radiant barrier and reflective insulation systems, and can be used to seal flexible air ducts and connectors. In addition, metalized aluminum tape is resistant to moisture, flame spread, smoke generation, and high temperature. 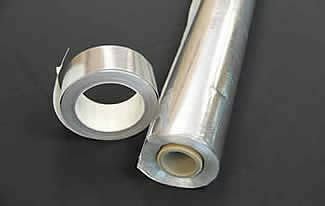 Aluminum foil tape is a high strength dead soft tape coated with cold weather solvent acrylic and available in either 1.5 mil or 2.0 mil. Our standard aluminum foil tape is malleable, excels in demanding temperature and humidity applications, and features an electrically conductive adhesive. Provides an electro-conductive coating for the protection against high-frequency (HF) radiation and low-frequency (LF) electric fields. This paint has indoor and outdoor applications, and protects areas where a traditional foil is difficult to apply (i.e. floors, wood frames, or other irregular surfaces). Signals Defense provides a wide range of RF Fabrics and can provide custom solutions to your needs. Various fabrics can provide innovate and unique solutions to reducing RF energy. Ask to see our selection of products to fit your needs. For a detailed technical spec sheet, samples of our RF window films or rFoils or for information about how this could secure your building, please order FREE samples here.